Shervin Pishevar’s Hyperloop One recorded another first today, though not one as exciting as making a hunk of metal go really fast in the desert – it created a business case. 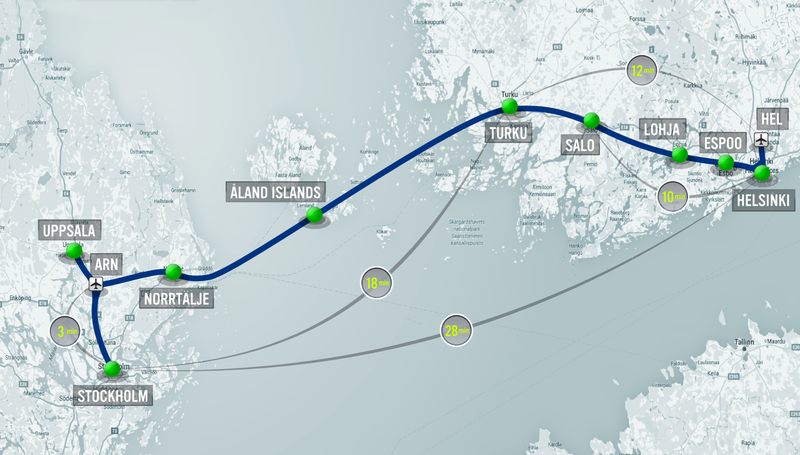 The business case (via Gizmodo), created in partnership with engineering firm partners and consulting firm KPMG, is meant to walk potential investors through the value proposition inherent in a proposed Hyperloop route connecting Helsinki and Stockholm. Hyperloop One leads the slide deck with the money slide combo: a before-and-after showing current travel times of three hours, thirty minutes (including travel time to/from airport, giving yourself a decent window so as not to miss the plane, etc.) by air, vs. a total trip time of 28 minutes for the proposed Hyperloop installation. Hyperloop, if you aren’t yet familiar, is the transit technology conceived by Elon Musk that uses pods in tightly controlled, tube-contained environments to reduce speed-limiting factors including friction and air resistance to propel the vehicles at super speeds. Musk came up with the idea, but cited a lack of available time as the reason he couldn’t pursue it himself. Pishevar’s Hyperloop One was one of the companies that took up the cause. It has had some recent successes, including a limited but technically impressive test in the Nevada desert in May, and an $80 million raise and name improvement around the same time. Recently, however, the startup experienced a considerable executive-level shakeup that saw the departure of CTO and co-founder Brogan BamBrogan. Of course, the business case they created doesn’t go into executive details – but it does talk about cost, which is estimated at just over $21 billion. But with an annual projected profit of around $885 million, it wouldn’t take that long to recoup that investment, speaking in the relative terms of expensive international transportation projects. Beyond all the financial estimates and business justifications, what this proposal does is put in stark relief the contraction of space that a Hyperloop network might one day be able to offer. Trips that were once an ordeal become less inconvenient than the average daily commute; provided ticket prices don’t negate the economic benefit, the definition of an urban space could be reconfigured as a result.